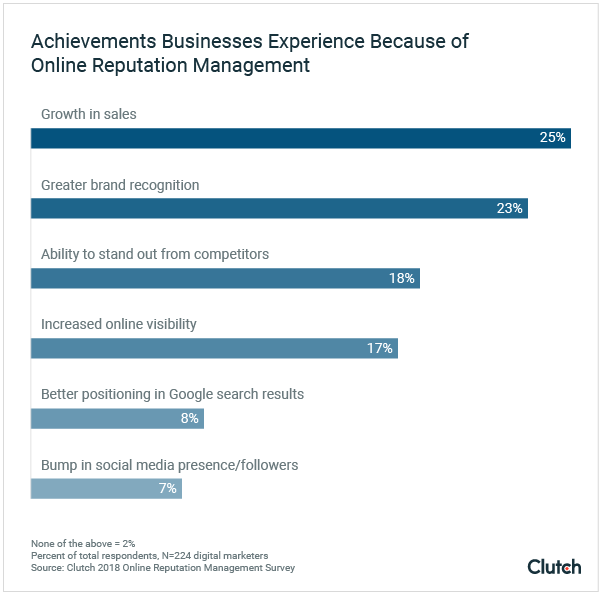 At Clutch, a third-party reviews website for B2B agencies, we understand how crucial it is for companies to maintain a positive brand image, and we surveyed 224 digital marketers in the U.S. to learn more about how businesses approach ORM. The survey respondents are employed by a company with more than 100 employees, are responsible for day-to-day digital marketing decisions, and allocate time and financial resources to ORM. 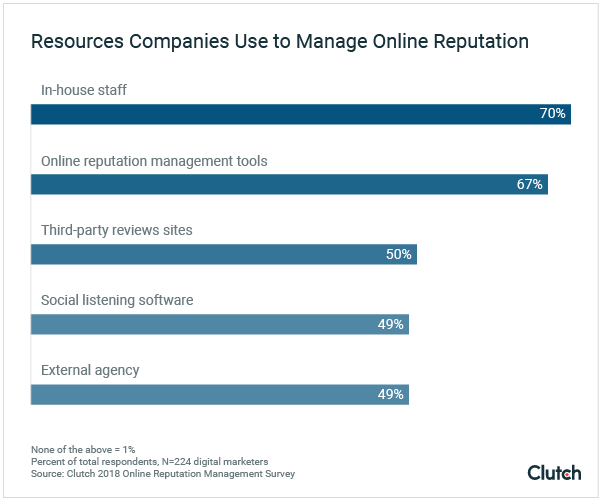 Using in-house employees to manage their online reputation is companies’ preferred method of devoting resources to ORM (70%). However, it’s surprising that not all companies consider ORM a vital element to success: 100% of companies should dedicate their attention to ORM, according to Ryan Goff, chief marketing officer and social media marketing director at MGH, Inc., an integrated marketing communications agency in Maryland. Online reputation management is critical for businesses to maintain a positive brand identity in the eyes of consumers. As more digital marketers understand the value of ORM in growing their business, they choose to devote more time and energy toward monitoring their brand online. The majority of businesses pay attention to their brand reputation daily because they understand that a single negative media mention can damage how people perceive their company. Simon Wadsworth, managing partner at Igniyte, an online reputation management agency in the UK, points to negative media content as a reason why brands lose potential customers. A single negative media mention can dissuade users from purchasing a product or service from a company. By frequently monitoring media mentions, companies can avoid the potential loss of a significant amount of new business leads. Social media has shifted the ORM landscape because it gives individuals free-reign to post about their experiences and opinions. This individual freedom limits the control companies have over their brand reputation. Whereas a company can control its Google search rankings, it cannot control individuals who may post a negative comment about its brand on social media. The rise of social media also presents some benefits for businesses. Social media gives companies the opportunity to converse firsthand with customers, according to Shannon Wilkinson, CEO at Reputation Communications, a reputation management agency in New York. “Social media enables companies to participate in conversations about their products, services, and industries. It also enables them to monitor those conversations to ensure they can be a part of them,” Wilkinson said. With social media, businesses are able to react and respond quickly to consumers’ inquiries or comments, enabling them to take part in a conversation that might not be available on a blog or reviews website. To mitigate the threat of damaging their brand reputation, businesses must devote resources to ORM as a part of their digital marketing strategy. We asked digital marketers to select which resources they currently use to monitor their brand online. Most of the businesses surveyed (70%) rely on in-house employees to manage their online brand reputation. 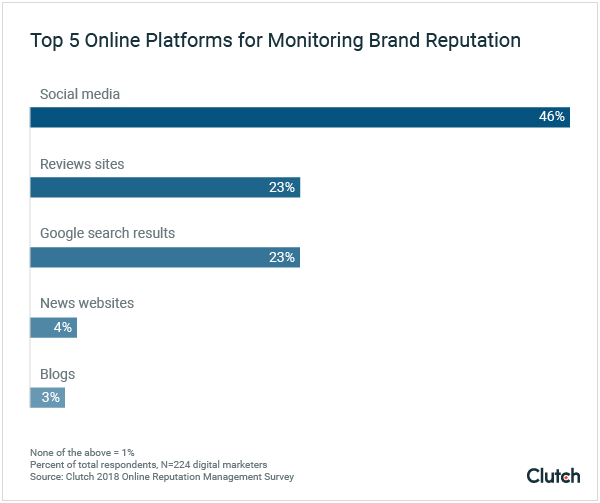 In-house resources are a preferred option for monitoring online reputation because employees are familiar with their company and can devote time to spreading a positive online brand image at a lower cost to the business. Online reviews sites also are an important resource for businesses to collect positive feedback from users who have experienced their product or services. Half of the businesses surveyed (50%) rely on third-party, online reviews sites to monitor their brand reputation. Having positive reviews can make or break a company that’s trying to earn new business leads. Goff predicts businesses will work to build a solid brand image on third-party reviews sites in 2018. “Companies now are focusing on pushing down negative reviews and bumping up positive reviews, all the while making sure that their full customer base has a voice,” Goff shared. Allowing individuals to share their experiences about a company is an important element to building transparency and trust with customers. ORM ensures what’s being shared about your company is positive rather than negative. Social listening tools, many of which are free, are another way for businesses to monitor their online brand reputation. Tools such as Google Alerts, Reputology, and Yext can be set up easily and at no cost to businesses that simply are looking for a tool that will notify them when their brand is featured negatively online. Consider these resources when selecting the right social listening tool for your business. Businesses derive the most value from allocating resources to ORM when they work with a professional agency. Public relations companies and online reputation management agencies offer a level of expertise that is not necessarily provided by a free online tool. Social listening software only can help businesses monitor their online reputation to an extent. Working with a professional agency enables companies to learn how to solve issues that arise online. Andy Beal, the “Original Online Reputation Expert” at Reputation Refinery, a boutique online reputation management firm in North Carolina, also points to expertise as a distinguishing element of hiring a professional agency over using an online tool. “It comes down to expertise. External agencies are experts in knowing where to look, helping you understand who your influencers are, which channels to focus on, what keywords to monitor, and what types of sentiment to look for,” Beal said. Professional agencies have experience in identifying target audiences, keywords, and sentiments that will elevate a brand’s online identity. Earning revenue is arguably the main priority for businesses. The fact that a growth in sales is the most noticeable impact from ORM is an even more telling sign that having a strong online presence is necessary for business’ success. Beal explained that there is a direct relationship between having a clean brand reputation and experiencing positive sales at a company. A solid online brand reputation clears the path for buyers to feel confident in deciding to purchase a company’s product or service. Some agencies have clients who were originally hesitant about hiring a professional agency but later saw a measurable increase in sales. “We have a law firm as a client. For years, they pondered whether they should hire a public relations agency and debated if ORM was even important, said Engelmayer. "Mid-last year, they decided to go for it. Since then, they have seen an uptick in people calling them and responding to what they see in newspapers and on television. The older generation in the firm now realizes this a great sales tool." Even older generation business executives are learning that allocating resources to ORM sets a clear path to financial success. Of the businesses that do not currently use a professional agency to manage their brand reputation, cost (54%) is the biggest factor that’s preventing them from hiring one. Nearly 40% of digital marketers also said they do not understand the value of hiring a professional ORM agency. Misunderstanding the value of ORM stems from a misalignment of priorities at a company. Companies may only choose to hire a PR agency after experiencing a negative online review or after generating negative press coverage. Companies should instead be preemptive about solidifying a positive online reputation to avoid negative coverage in the first place. “Companies should more focus on building and growing their online reputation proactively, rather than simply fixing things that may have gone wrong as a consequence of not spending time on ORM in the first place,” said Beal. Building a positive brand identity limits the resources a business may need to devote to ORM in the aftermath of a negative online experience. Digital marketers are expressing this behavior in 2018: More than 40% of businesses plan to hire a PR agency; 34% of businesses plan to spend more time and money on ORM. With the rise of digital platforms that enable individuals to share their opinions and experiences, businesses are choosing to expend more energy on ORM to solidify their online presence. As more individuals use social media and post online reviews, online reputation management is necessary to the success of a business. Our survey of 224 digital marketers in the U.S. indicates that businesses recognize the value of ORM and will increase their investment in ORM in 2018. First, more than half of businesses consider ORM “very necessary” to their success as a business. 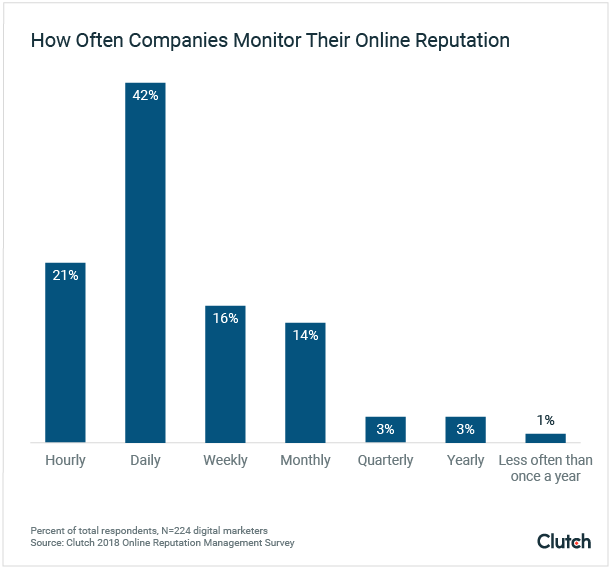 Second, digital marketers frequently monitor their company’s online reputation. More than 40% monitor their online reputation every day, and more than 20% monitor their online reputation every hour. Third, social media is considered the most important online platform to monitor. Nearly half of businesses (46%) use social media to see what’s been said about their brand online. Fourth, ORM sets a clear path to financial success. A quarter (25%) of digital marketers said the biggest achievement their company experienced since allocating resources to ORM is growth in sales. 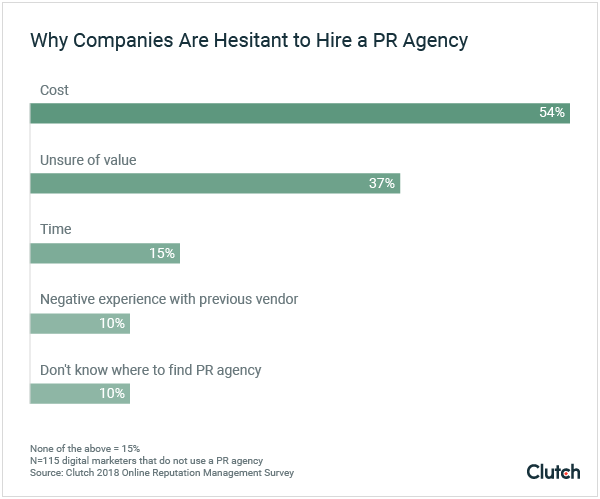 Finally, more than 40% of businesses plan to hire a professional PR or ORM agency in 2018. Clutch surveyed 224 digital marketers above the age of 18 and located in the U.S. Survey respondents must be employed by a company of more than 100 employees, responsible for day-to-day digital marketing activities, and allocate time and financial resources to online reputation management.